I love good typography, even more so as Microsoft Word and PowerPoint have debased our standards. When I see a really fine piece of technical typesetting, it’s almost always done using TeX and friends. Beautiful LaTeX documents are easy to recognize. 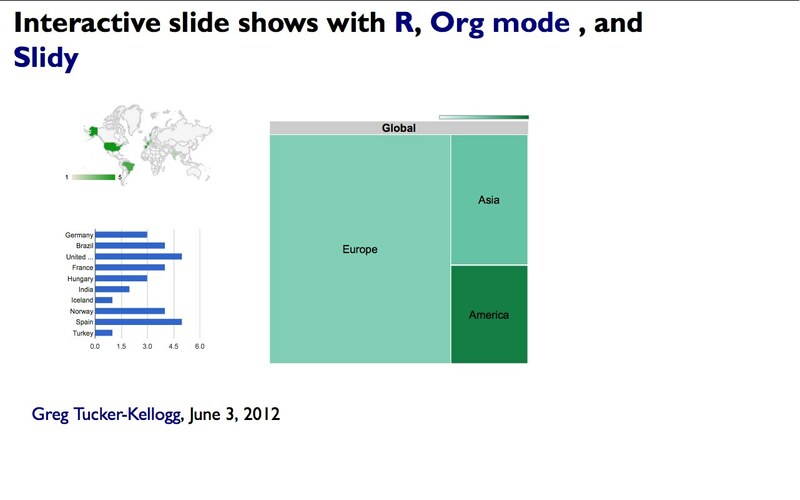 Beautiful R graphics are also easy to recognize. When literate programming systems like Sweave, Org mode, or knitr weave R graphics and LaTeX typesetting together, the beauty of both LaTeX and R is obvious, but documents can still look all wrong because of font clash. 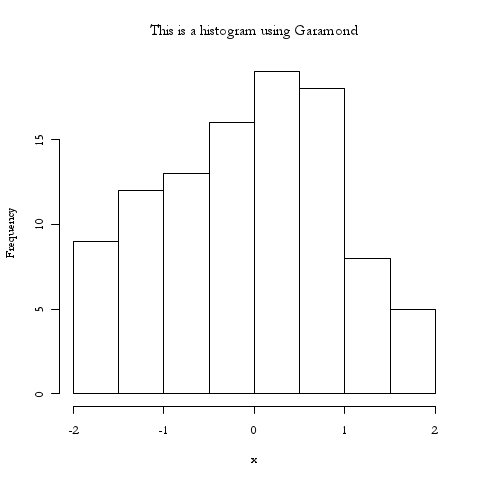 As wonderful as R is for plotting, changing the fonts in plots can be a bit cryptic. The base graphics package has methods, but lattice and ggplot2 are built on top of the grid package, which is another beast entirely. The extrafonts package described by Winston Chang is a terrific option for individual plots, but at least for me it didn’t seem quite clear how to change an entire literate document in a single line. An alternative is the Cairo package which provides the ability to change fonts in any supported device. Cairo also provides its own drop in replacement commands to the standard commands png(), pdf(), etc., which can be dropped in for a literate programing session. I’d be interested to know what limitations others have found in these replacements. Most of the time I use the LaTeX mathdesign package with Charter BT fonts. But I’m fickle, and sometimes use urw-garamond. When preparing Beamer presentations at NUS I tend to use Verdana, because that’s the university’s standard. Since I’m almost always using Org, with R blocks evaluated in the Babel literate programming framework, I want a solution in which all the graphics generated by R will match the LaTeX main text font as closely as possible. When I move an R code block from a beamer presentation to a manuscript draft, I don’t want to have to do anything special. It should just work. With that in place, my fonts in exported PDF or PNG graphics from R will all use Garamond, largely in keeping with the LaTeX font. Strictly speaking, the urw-garamond in the LaTeX mathdesign package is not the same as the system font on MacOSX that R will be using, but it’s pretty close. Note this has to be done in each R session if an Org-mode file is running multiple sessions. The Cairo package is all well documented stuff, though I have to admit I found the other ways of handling graphics fonts confusing. But within the limits of the four choices available in Cairo, one can mix and match system fonts. If your locale supports UTF-8, you can do some crazy things. 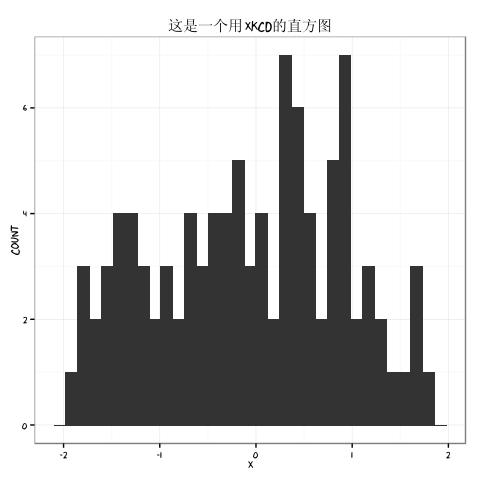 For example, you can redefine the italic family to a font that supports Chinese characters, and create something completely nonsensical, such as a ggplot histogram with text in a mix of xkcd and Chinese, e.g. Alas, the XKCD font is not Unicode, so there are no Chinese xkcd characters. But then Markus Gesmann wrote a interesting blog post about using knitr and the googleVis package to produce interactive HTML presentations by converting the knit-produced markdown to Slidy, and I wanted to do the same in Org mode. Markus gamely provided the Rmd source for his own slide show in a GitHub gist, so with his permission I borrowed some of the same visualizations (not the whole thing, which would be shameless) in an Org mode demo. So instead I’m using org-slidy, which exports to Slidy, the same format Markus used. It’s easy if you already have emacs, and pretty straightforward even if you don’t. Any R code source blocks can be done as usual. The googleVis package creates HTML code for embedding into web pages, so the way to specify this is with #+BEGIN_SRC R :results output html, which will capture the output of print() statments on googleVis created R objects. And you can get the actual Org mode file in a gist on GitHub.